I'm Melanie and a traveling coffee blogger based in the South. This space is about more than coffee though - it's about the people who serve it, the spaces you drink it and the convos that bloom around it. Won't you join me? I find myself down in Augusta fairly often. I love the adorable downtown area and the river that runs through it. When I think of Augusta, I think of the Old South. I had to Google it, but I found that Augusta was established in 1735 and is indeed the second oldest city of the Georgia colony. The first? You guessed it. Savannah. It's only fitting the Old South is filled with old tradition. Especially the old tradition of Southern hospitality. I wasn't sure what to expect when I visited Buona Caffe. I'd read a few reviews that had nothing but positive things to say, but you just never know until you visit a place yourself. I knew as soon as I walked in: this place is a keeper. One you'll want to visit again and again. I trotted in with my crew from work and stared at the wall of options. The conversation that unfolded revealed this barista's name to be Carston, who is himself an Aussie. Now, if you know that a flat white is actually an Australian beverage, you'll also smile to yourself at the irony. Take heart - it was indeed a perfect micro-foamed flat white. Carston had been at Buona for quite some time and began to give a little bit of the history. Buona began with couple who liked their coffee fresh and began to roast it at home. From their kitchen, it flourished into a place where they took orders from friends. Suddenly, they found themselves thinking they could really run a business out of it. They upgraded from a one-pound roaster to a twelve-pound roaster and began a business in 2010! After crushing the Augusta coffee scene, they opened up a shop in 2013. The roaster is located in the back of the shop and beans are available for purchase at the location (or online for that matter). But let's talk about the coffee. This is a homey coffee shop, but they do not skim on specialty coffee. Normally, when I see flavored latte options in a small town coffee shop, I assume that quality speciality coffee is lacking. BUONA BLEW THAT ASSUMPTION OUT OF THE WATER. Yes, they have caramel and chai lattes, but they've also got pour-over options, whether it be an individual or a Chemex to share among friends. It doesn't stop there. Their syrups used in flavored coffees are home-made. After talking with Carston about the best 'iced' drink to take back to friend who doesn't normally drink coffee, he said the caramel latte was a must. We tried the home-made caramel syrup...and OH MY GOSH. It was the perfect mix of butter and sugar. I think we might have ordered three of them to go. There are some pastry and sandwich options as well. Amongst our crew, some got quiche, some ordered a cinnamon bun (which was giant BTW) and others attached themselves to a crumbly scone. Let's just say this; no one had any complaints! Happily sipping my flat white, I went back up to the counter to check out some beans to take home. My man Carston helped me out again. I explained that I preferred a light to medium roast of a fruity coffee. With zero hesitation, he said I wanted the Nicaraguan coffee. They were out, so he went into the back and put a fresh bag together. I mean, does it get better than this? I turned around and Carston had also thrown together a piccolo for me to try on the house. A piccolo is a single ristretto shot in a macchiato glass that is filled with steamed milk. I tried it for the first time and became an immediate fan. The inside of the shop is very homey. No fancy furniture, but everything that you'd need. There's a side room with plenty of natural sunlight that makes for a great place to study. At the center of it is a communal table that looks like it could host about eight folks. There's a nook with a couch and a couple seats on the other side of the shop for groups looking to stick together. I kind of a got a New Mexico stucco and terra cotta vibe inside with the decor. Have you sensed how much I adored this place yet? I'll come back again and again. Carston was by far the most friendly, genuine and kind barista I've met thus far. Chelsea, working along side him, was also such a sweetheart. 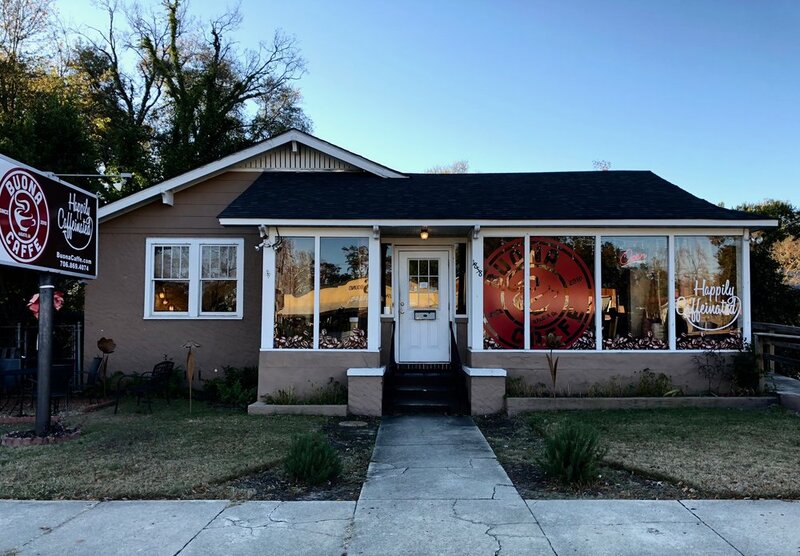 The people are what make coffee shops great and this one has my best possible thumbs up for anyone in the Augusta area. And have not stopped raving about it. Get happily caffeinated! I'm so excited to have you apart of the coffee hunch tribe! You can count on a bi-monthly newsletter - enough to keep you in the know, but not crowd yo inbox.